The museum, the statuary, the grotto, and the movie theater are the loci of Adam McOmber’s debut collection of stories, This New and Poisonous Air. Traditionally, these are receptacles of the already-departed, shrines to artifacts lost to memory even before they have aged; “What soul motivates these new creatures,” asks a character in “The Automatic Garden” of the automata of the title. “He assures us it is mere water and steam, but, dear reader, I tell you it is more than that.” More indeed, for here the inanimate educates and replicates the animate, even stands in for it. McOmber’s choice of subjects—curator, creator, collector—tempts the reader into drawing an analogy between the Madame Tussaud of “There Are No Bodies Such As This” and the Thomas Francini of “The Automatic Garden,” between Francini and the Robert Southey of “Egyptomania,” between Southey and McOmber himself. But there is no Wizard here, no Caligari, no curtain or cabinet at all—McOmber’s collection is not, finally, an automatic garden or a wax museum, not a metafiction. When Cornazzano confronts his former partner Francini, the creator of the garden, he “realized something was wrong…this was not Francini. It was not even alive.” It is an automaton. Cornazzano wonders “if [his] old friend even still existed.” Francini, erstwhile Creator, has gone too far, inserted himself into his manufacture, possibly erased himself in the process. Far from metafiction, this is mise en abyme. Where, then, do we find McOmber? This “great geometry” is the alchemy of physics and consciousness whose philosopher’s stone anchors these stories. They are transmutations, metamorphoses, or translations of inner states into reality: an “invert” (an archaic term for homosexuals) subverts gravity and flies; a lovesick girl steps through a door below a movie screen and disappears—we suspect, but are never told, into the movie playing above her; a man disappointed in love builds a 1:1 model of the world more perfect than the one he inhabits. I’ve tried to come up with a comparable experience to describe what I witnessed…and the only event that comes close to seeing Amon Garrick levitate is seeing my father in his coffin, his body impossibly stiff and painted among the silken folds. The lack of motion in my father’s normally animated face was so unbelievable that my mind attempted an adjustment. I actually saw his brow lift, his lips purse because I knew they must move. Likewise, seeing Amon step off the ground and stand in midair, my mind attempted a correction…I imagined the shadow of his boots had taken on some unknown weight and become part of his foot, that the shadow was, in fact, pushing him off the ground. This skeptical use of the fantastic in McOmber’s fiction seems at first a reference to Poe, to Poe’s blend of the fantastic and the real. But Poe’s was often only a science of spite, sugar to make the bitter pill of his satire swallowable. McOmber’s is the science of melancholy. It has the lyric at its heart, loss at its core. What are these automata, dummies, relics, artifacts, and antiquities, but shells of people we once knew, memories of past selves? We wish them into life, breathe something of our own essence into their brittle hulls wanting to reanimate them, but only find ourselves diminished. Or is it that thus we transfer some bit of ourselves to them? Let us then imagine that it is not some unknown curator at the helm of the exhibit of us, but that we are in his place, essaying an exhibit of ourselves. Can we do any better than this stranger with the cast-offs we have left behind, the contents of attics and storage units, basements and closets? Are we there in any particle of them? We tell stories about ourselves by telling stories about others, populating our exhibits with wax figures stolen from other museums, clothes and furniture from other eras. The figments of our imaginations are also the real contents of our lives. We make metaphor simply by living, by drawing things that already exist close. 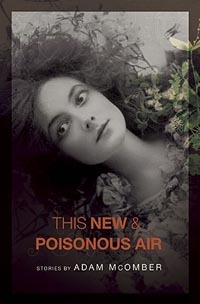 This New and Poisonous Air, rather than attempting another askew autobiography, instead opens its cabinet of curiosities to us, and asks us to make them mean. It seems a surprisingly honest book—not a mirror, for that would reverse, but a portrait whose brush-strokes are as close to the flesh-and-blood hand of the artist we are likely to get. Gabriel Blackwell is the author of Critique of Pure Reason (Noemi, 2012). His fiction and reviews have appeared in Conjunctions, Puerto del Sol, American Book Review, DIAGRAM, and Uncanny Valley. He is the reviews editor of The Collagist.